BAMYAN, Afghanistan, October 11, 2012 (ENS) – To strengthen Afghanistan’s ability to withstand climate change, the government and United Nations partners today announced a US$6 million initiative, the first of its kind in the country’s history. 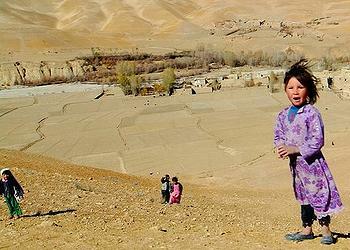 The program will be run by Afghanistan’s National Environmental Protection Agency, NEPA. It aims to reduce the vulnerability of communities to the effects of climate change, such as drought, floods and erosion, and to build the capacity of Afghan institutions to address climate change risk. Improved water management and water use efficiency as well as community-based watershed management are among the ways the program will strengthen resilience to climate change. Watershed management activities at the village level will include tree-planting, the terracing of slopes or the gathering of wild seeds to re-plant over-grazed mountainsides. The program will cover climate-related research and early warning systems; improved food security; and rangeland management. Education and the development of vocational skills in communities also will play a key role in this project. The initiative will be implemented by the United Nations Environment Programme, UNEP, and funded mainly by the Global Environment Facility, an independently operating financial organization composed of 182 countries and including international institutions, civil society organizations and the private sector. The climate change initiative will go ahead in four locations: Badakhshan in the northeast, Balkh in the north, through the Koh-e Baba to Bamyan and Daikundi in the Central Highlands. “The Government of Afghanistan is showing a remarkable commitment to working with communities for a landscape approach to dealing with climate change in the country,” said Michael Keating, the UN’s Afghanistan resident coordinator, speaking from Bamyan in the Central Highlands, 200 km west of the capital Kabul. “We also welcome the opportunity to help Afghan institutions better deal with shocks and hazards, and increase resilience at a decentralized level,” Keating said. Since 1998, more than 6.7 million Afghans have been affected by disasters and extreme weather events such as drought, earthquakes, disease epidemics, sandstorms, and harsh winters. 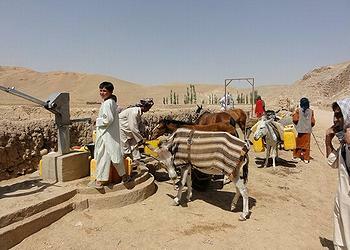 UNEP has identified Afghanistan as one of the countries most vulnerable to climate change, because of the potential impacts and its current limited capacity to react to these impacts. Climate change adaptation is especially important in developing nations, which are predicted to bear the brunt of climate change effects. The goal is to reduce the vulnerability of biological systems to these impacts. Climate change is predicted to cause an increase in mean annual temperatures, a decrease in mean annual rainfall and at the same time an increase in the intensity of the rains that do occur. Natural ecosystems throughout the country are very fragile, and the degrading effects of increasing human activity in many areas are worsened by current climate variability, especially frequent droughts and extreme floods and erosion. Many of the agricultural activities in Afghanistan are dependent on the flow of rivers that originate in the Central Highlands area. After living through a drought in 1998-2006, the country experienced another severe drought in 2008-09. These droughts both led to loss of staple crops such as wheat, rice, maize and potato. To help accomplish the goals of the program, UNEP will work with three other UN agencies – the Food and Agriculture Organization, the World Food Programme and the UN Assistance Mission in Afghanistan. The UN agencies will cooperate with the USAID-funded Biodiversity Programme of the Wildlife Conservation Society and local Afghan organizations and communities.